Water flows into your home on a daily basis for essential uses, but how much do you know about your water supply and its circulation through your living space? Are you ready for a household water emergency? These tips can help you prepare for the unexpected. Know how to turn it off: In the event of a plumbing failure in the home, the first order of business is to turn off the water at its point of entry. 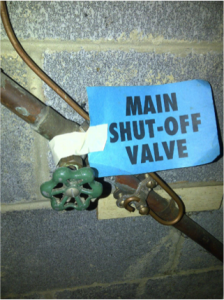 This is done at the “main water shut-off valve.” Locate and label this valve. Make sure the valve is easily accessible at a moment’s notice (e.g., don’t store items in front of it). If your house is to be evacuated and left unheated during cold weather, the water supply should be turned off at the main shut-off valve and pipes drained. This will help prevent water freezing and bursting the pipes, leading to extensive water damage. Remember that water expands at 4 degrees Celsius (39 degrees Fahrenheit), a phenomenon that keeps plumbers busy in winter! Know how to drain the pipes: Once the shut-off valve is closed, drain valves should be opened to drain the water remaining in the pipes. Drain valves are usually located on the downstream side of the shut off valve; sometimes they are separate valves. Draining water can be collected in a bucket. When draining water pipes, it is a good idea to open all faucets. Have an emergency water supply: Home water storage is an important measure in preparing for natural disasters, such as floods, hurricanes, earthquakes, tornados and ice storms. How much water should you store? The US Department of Homeland Security encourages individuals to store enough water to last a minimum of three days, bearing in mind that water is needed for drinking as well as for personal hygiene. For each person in your household, store at least one gallon per day in a cool, dark place. For example, a family of four should store a minimum of 12 gallons of water for a three-day period. You may purchase a sufficient quantity of bottled water or choose appropriate containers for water storage, disinfect them with a chlorine bleach solution, and add tap water. If your household uses private or untreated municipal well water, disinfect the water prior to storing using unscented liquid household bleach containing 5.25 percent sodium hypochlorite. Please see Water Storage Tips to Assist in Emergency Preparedness for more information. Tip: In a water emergency, recycle dishwater or personal hygiene water to flush toilets.